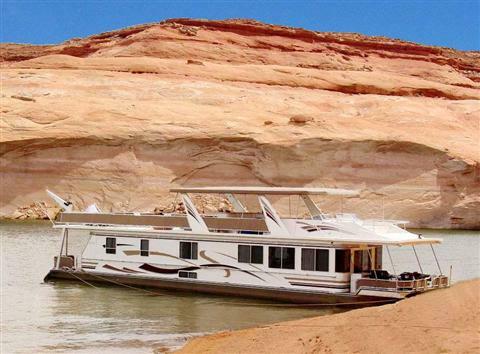 Experience the trip of a lifetime at Lake Powell houseboat rentals. We servicing the most favorite houseboating lakes in the world. A houseboat is a large boat that has been designed to be used for normal home dwelling accommodations at a designated lake. 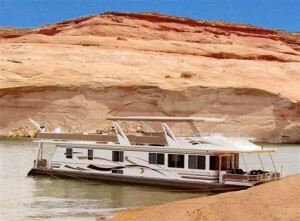 We provide the quality houseboat rentals at Lake Powell at every marina. This is nothing like houseboat rentals in you private yacht with all the amenities, similar to your own home. Houseboat rentals are a very popular water sport recreational activity for groups of people of all ages, houseboats of all varieties and capacities, ranging from more modest 30–40 foot boats to 75-foot luxury houseboat models at Lake Powell with a double decked. Houseboating rentals are appealing due to the ability to more completely explore the local scenery, stay on a lake longer with all the conveniences, remain in close proximity to other outdoor activities like wakeboarding, wakesurfing, kneeboarding, wakeskating, air chair, and boat tubing. The nice thing about Lake Powell houseboat rentals is being able to move the living quarters for a change of view, or neighbors, on a calm waters. Enjoy houseboat rentals at Bullfrog Marina, Wahweap Marina, Halls Crossing, and Antelope Point Marina in Lake Powell. Houseboat Rentals on Lake Powell is the most popular vacation in the United States since the Glen Canyon Dam impounds water from the Colorado River to form almost 2,000 miles of red rock and sandy beach camping. Lake Mead house boat rentals is the largest man-made lake in North America, about 30 minutes from Las Vegas, Lake Mohave houseboat rentals are located in Laughlin NV and Bullhead City, AZ and Lake Shasta in the mountains just outside of Redding, California, are also popular spots for houseboats and jet ski rentals. Jones Valley Resort on Lake Shasta rents the largest three story houseboat on the lake, in the twenty-two passenger Titan. We specializes in luxury boat rentals on Lake Shasta, also carries houseboat rentals on Lake McClure and New Melones Lake just southeast of Sacramento. Houseboating is also common in Lake Cumberland, Lake Amistad, Trinity Lake, Lake Mohave and Lake Mead National Recreation Area. In New York, houseboats have also become a major part of the great South Bay on Long Island. Houseboats are also available for rental Lake Trinity, Lake Berryessa, Lake Don Pedro and many more throughout Utah, Nevada, Arizona, Oregon, Washington, Canada, Texas, and California.